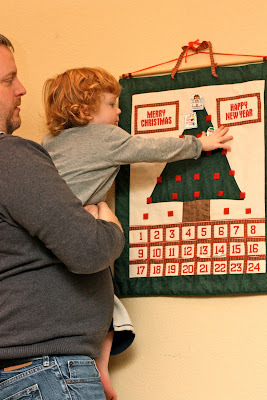 My boys LOVE doing Advent calendars... and this year they're in Heaven since we are not only doing the calendar that Nana made for them, but also a Lego calendar. 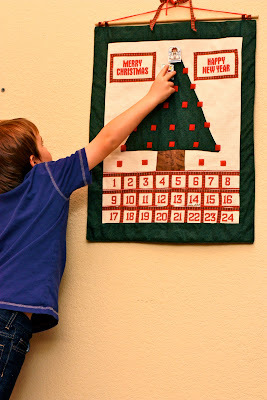 They're having such a good time doing this... originally I was going to get two "toy" advent calendars for the kids (like the Lego one)- that way each boy got to open a toy each day- but I'm re-thinking this idea... I like the idea that they don't get a "gift" each day- that they have to share this. And this is hard for both of my boys. It's hard for Zac because he's a baby and doesn't share well... and it's hard for Deacon because he's never had to share something like this before in this capacity. But I think it's a good lesson for them, and so far it's been a good experience. I was worried, at first, that with the addition of the Lego calendar that that they wouldn't be interested in the Advent calendar that my mom made them. Boy was I wrong. As with every other year, they absolutely loved it... as I did when I was a kid. p.s. Notice the new haircuts??? I know it's not too drastic- which is exactly what I wanted... we found new fantastic hair stylist for Zachary. He doesn't do well with getting his hair cut, so we need someone who can deal with him throwing a fit- and can do this FAST. This lady did such a great job- I know the hair cut isn't the most amazing thing ever- but if you saw how he was acting you would be a lot more impressed, LOL.